Shock horror! Yep that’s right, I’m not ‘Raw’. You can’t be raw. You can eat raw food, or you can eat cooked food (does that make you ‘cooked’? ), or you can eat a combination of both (what does that make you...Confused?) But you can’t be raw. Please don’t label me (or judge me for that matter), by what I choose to eat. Choose...that’s the key. Has a meat eater, who one day chooses to eat a cheese and tomato pizza, turned vegetarian? ‘Heaven forbid!’ he’d say, or words to that effect! So I eat raw...but only in that moment in which I choose to eat something that isn’t cooked. It’s a choice I make about what I put into my body at that moment in time, that’s all. It doesn’t and shouldn’t define me as a person, I am way more complex than that. I eat raw in that moment, that’s all. If I choose to eat something cooked, (there’s that word ‘choice’ again) ....btw. my fella makes the best garlic mushrooms....does that mean I’ve failed? Failed what? Is this a test? An exam? – er...NO! What is it that I have I actually failed? I chose to eat something cooked? So what? It was a conscious decision, one at that moment in time I was totally happy with. I haven’t broken some law, it’s not illegal....It doesn’t change who I am does it? Choose what you love, love what you eat. Hell this is meant to be fun isn’t it? If it wasn’t fun, if it was hard work, required a shed load of willpower...do you think I’d choose to do it? It’s just food. There is so much more to me than the food I eat, so don’t label me as ‘Raw’. Am I Raw? No! I AM ME. Pure and simple (well hopefully not that simple!) I eat as much raw as I choose (choice again) which does happen to be most of my food right now, but that doesn’t make me ‘Raw’. It’s just one part of who I am. Being ‘Raw’ is just a label, and a very loose one at that. Some people may choose to embrace it and use it to define who they are. However, there is so much controversy even in the relatively small Raw Food World, so what does labelling yourself as ‘RAW’ actually mean? For a start, all so called ‘raw foodists’ are different. 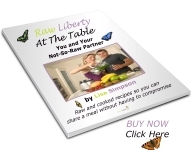 I know many people who follow a raw food lifestyle (I use the term loosely) and no two eat the same way. There are so many gurus who have declared that their raw way is the definitive way to be raw. And yet you then read someone else’s teachings, and discover that they have a totally different view point. So does labelling yourself ‘RAW’ actually serve a useful purpose? I don’t think so. Don’t hang everything on how raw you are, I hate the whole percent thing....I mean are we going to be pedantic here? I once heard a 3yr old asking another young child if they were 100% raw! WTF!!!!! To set yourself a goal of being 100% raw, is to set yourself up for failure. The moment something cooked passes your lips, be it steamed broccoli, bacon buttie, or a jam doughnut YOU HAVE FAILED!!!!! who may make a conscious choice to eat food that is uncooked more often, in varying degrees, than food that is cooked. So...I AM NOT RAW....there is so much more to me: mother, daughter, sister, friend, lover, ex, chef, speech and language therapist, taxi driver, cleaner, gardener, get the picture? There’s so much more to life than the food I love to eat, so much more to happiness than the food that passes my lips... So please don’t label me by just one aspect of my life, it tells you so little about who I really am. Nicely put Lisa. Go on being you, its exciting seeing all the different sides of you and it certainly ups your street cred in my eyes! mmmmm, garlic mushrooms- LOVE :D Precisely Lisa. Precisely. Beautifully put. that is all!